Award-winning journalist Rania Abouzeid dissects the tangle of ideologies and allegiances that make up the Syrian conflict through the dramatic stories of four young people seeking safety and freedom in a shattered country. Hailed by critics, No Turning Back masterfully "[weaves] together the lives of protestors, victims, and remorseless killers at the center of this century's most appalling human tragedy" (Robert F. Worth). 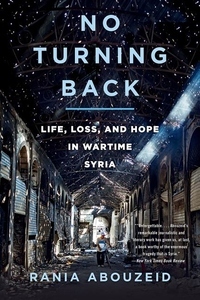 Based on more than five years of fearless, clandestine reporting, No Turning Back brings readers deep inside Bashar al-Assad's prisons, to covert meetings where foreign states and organizations manipulated the rebels, and to the highest levels of Islamic militancy and the formation of the Islamic State. An utterly engrossing human drama full of vivid, indelible characters, No Turning Back shows how hope can flourish even amid one of the twenty-first century's greatest humanitarian disasters.